The First Hellenic Republic (Greek: Αʹ Ελληνική Δημοκρατία) is a historiographical term for the provisional Greek state during the Greek War of Independence against the Ottoman Empire. It is used to emphasize the constitutional and democratic nature of the revolutionary regime prior to the establishment of the independent Kingdom of Greece, and associate this period of Greek history with the later Second and Third Republics. In the first stages of the 1821 uprising, various areas elected their own regional governing councils. These were replaced by a central administration at the First National Assembly of Epidaurus in early 1822, which also adopted the first Greek Constitution, marking the birth of the modern Greek state. The councils continued in existence however, and central authority was not firmly established until 1824/1825. The new state was not recognized by the Great Powers of the day, which, after initial successes, was threatened with collapse both from within due to civil war and from without through the victories of the Turco-Egyptian army of Ibrahim Pasha. 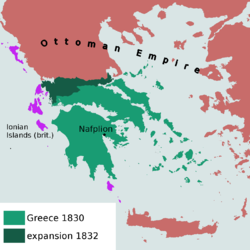 By 1827 the Greek revolution had almost been extinguished on the mainland, but by this time the Great Powers had come to agree to the formation of an autonomous Greek state under Ottoman suzerainty, as stipulated in the Treaty of London. Ottoman refusal to accept these terms led to the Battle of Navarino, which effectively secured complete Greek independence. In 1827, the Third National Assembly at Troezen established the Hellenic State (Ἑλληνικὴ Πολιτεία) and selected Count Ioannis Kapodistrias as Governor of Greece. Therefore, this period is often called Governorate (Greek: Κυβερνείο). After his arrival in Greece in January 1828, Kapodistrias actively tried to create a functional state and redress the problems of a war-ravaged country, but was soon embroiled in conflict with powerful local magnates and chieftains. Kapodistrias was assassinated by political rivals in 1831, plunging the country into renewed civil strife. He was succeeded by his brother Augustinos, who was forced to resign after six months. The Fifth National Assembly at Nafplion drafted a new royal constitution, while the three "Protecting Powers" (Great Britain, France and Russia) intervened, declaring Greece a Kingdom in the London Conference of 1832, with the Bavarian Prince Otto of Wittelsbach as king. This page was last edited on 24 February 2019, at 23:04 (UTC).